Inspiration for travel can come from anywhere. In this case, it came from the good ole television. CBS Sunday Morning and CBS 60 Minutes are two of my favorite TV shows. Call me nerdy, but they both consistently deliver top-notch television including interesting stories, biographies, and entertainment highlights. In late 2018, there was a segment on CBS Sunday Morning for To Kill a Mockingbird and a segment on 60 Minutes about the New York Philharmonic. Both episodes highlighted the amazing talent of two men, Jeff Daniels and Jaap van Zweden. The stories were so compelling that my Mom and I decided we had to go to NYC to experience both shows for ourselves. We bought tickets almost immediately, and we were well on our way to building a fantastic long weekend getaway. While there are three options for flying into New York - LGA, JFK, and EWR, we chose EWR since it’s a major United hub and there are well-priced flights multiple times a day. Also, based on our arrival times, travel to Mahanattan from EWR took only 30 minutes in an Uber. We landed at 2PM and were in the city by 3PM, just in-time for our hotel check-in. In advance of this trip, I spent a significant amount of time looking at different hotel options. New York is one of those cities with SO MANY hotels that it can become overwhelming to pick just one. Also, many of the luxury hotels are actually quite old, small, and come with unreasonably high price-points. I was looking for a new or newly renovated hotel with a fair price (i.e., one that did not include a $50 resort fee that is essentially useless in NYC). The AC Marriott Times Square ended up being the perfect option. It is a no-frills, brand new hotel in the Garment District, which is close-enough, but far-enough away from the craziness of Times Square. The rooms are clean, modern, and spacious. We paid less than $200 a night - a great deal! Once we were settled at the hotel, we started making our plan for the evening. We had heard through the grapevine that the musical Beautiful was amazing, however we didn’t buy tickets in advance. 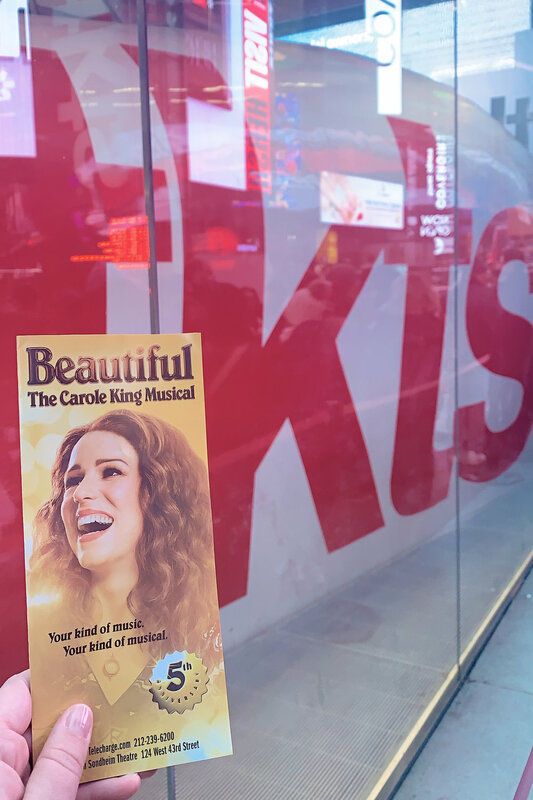 The musical has been running for over five years on Broadway, so we figured it would be a good candidate to find day-of tickets. TKTS is a half-priced ticket outlet that starts selling tickets at 3PM each day for shows that evening. We arrived at the Times Square location at 3:30PM and the line was already very long. We stuck it out, and within 45 minutes we scored 12th row Orchestra tickets for less than $100 each! 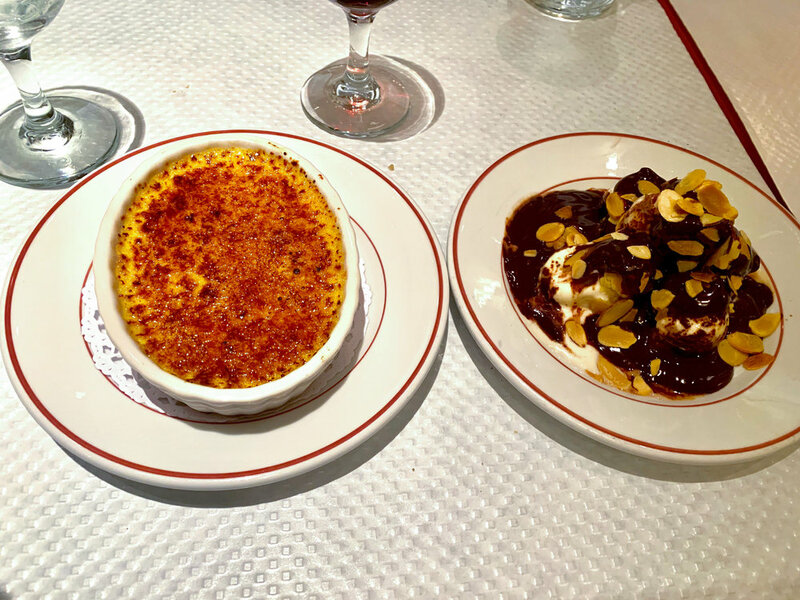 For dinner, we had our eye on Le Relais de Venise, a no-reservation French Bistro in Midtown. To beat the crowds and ensure we had enough time before our show, we headed over at 5PM. This restaurant has a set menu of steak-frites, served with a house salad and your choice of wine and dessert. The green salad with walnuts and fresh French bread was amazing paired with their house red wine. The steak is brought out hot from the oven, sliced thinly, and covered with this amazing earthy, green sauce. It is served with piping hot, thin-cut frites. The combo is to die-for. They keep extra steak and frites over candlelit flames in case you want seconds (duh)! For dessert, we opted for the crème brûlée and chocolate profiteroles. Such a great dining experience - I would highly recommend this restaurant! After dinner, it was showtime at the Stephen Sondheim Theatre. We arrived 30 minutes early and settled into our amazing seats. It was shortly after the opening piano sequence that I quickly realized that we were in the big leagues of NYC Broadway. The lights, the costumes, the music, the acting — AMAZING! Beautiful tells the life story Carol King and her adventures in song writing, friendships, love, and family. Both the story and music are compelling, emotional, and fun! My Mom and I both LOVED it! Hotel blackout shades make it very difficult to get up early (amiright)? We took the opportunity to sleep in on Saturday since we had brunch reservations at 10:30AM. 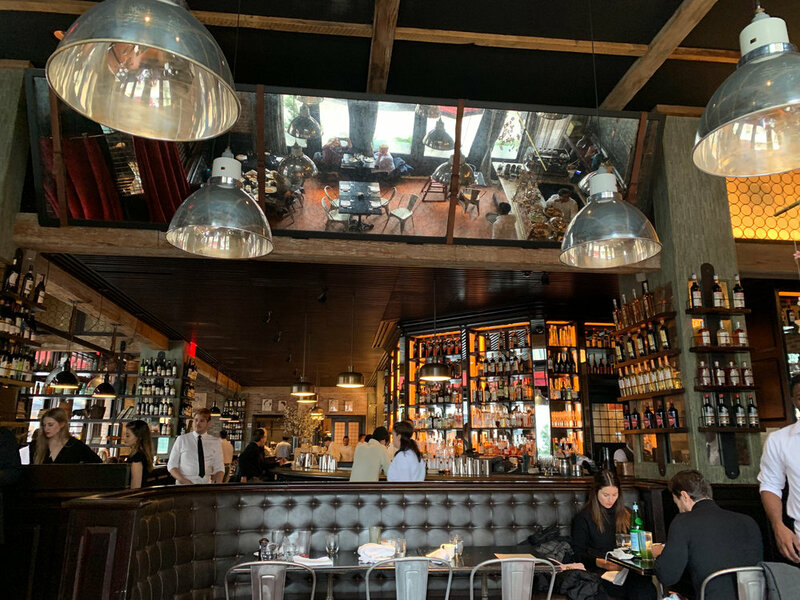 We headed down to Lower Manhattan to Locanda Verde based on recommendation from my friend Alex. It was an upscale, cozy spot that was full of families enjoying their Saturday morning together. Their lattes were incredible; paired with the lemon curd pancakes and French toast, we had a great start to the day. Another great store in SoHo is the MoMA Design Store. Whoever is in charge of curating their art and design products does an amazing job. I bought a tray set for my condo that I love! Our last stop in SoHo was the Nolita Milk Bar. This location is a small walk-up coffee-stand setup. We bought a few cookies and their famous BDay Cake Truffles. The truffles are delicious! After a quick afternoon nap, we got ready and headed out for dinner at The Smith which is perfectly located right across the street Lincoln Center. This restaurant is an establishment in NYC with a few different locations throughout the city. For my Chicago friends, it has a very similar vibe as Quartino’s. Making a reservation is totally necessary, especially for busy weekend nights. We split the Caesar Salad and Braised Short Rib Cavatelli for dinner and loved the Caramelized Apple Pie for dessert. Now it was time for the main event - the New York Philharmonic! David Geffen hall is truly remarkable, both inside and out. Plan to get there at least 45 minutes before showtime so you can walk around, get settled, and watch the musicians warm-up. Seating closes five minutes before showtime, and they do not allow late entrance. The show was built in two segments. The first segment was Beethoven’s Piano Concerto No. 2 with the grand piano being the star of the show. It was incredible for piano lovers like myself. The second segment was Rachmaninov’s Symphony No. 2 with the horns and drums adding an amazing intensity. The musicians are remarkable, and likely the most talented in the world. The theater itself was a sight to see. Day 2 was in the books and it was nothing short of amazing! 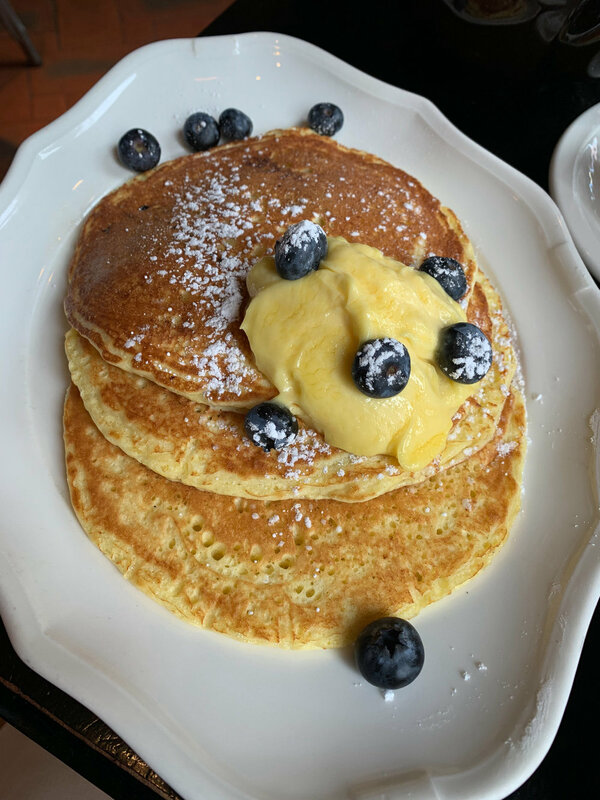 While there is no hotel lounge or restaurant within the AC Marriott itself, the hotel provides a $10 breakfast voucher for Gold or Platinum Elite members for the restaurant next door, Boqueria. It’s a Spanish tapas place that is highly rated overall, however their brunch selection was not ideal. The food was not great and the price point is too high for what you get. I would suggest declining the breakfast voucher and taking the points instead. After breakfast, we headed out for a longer walk up towards the art district. We redeemed our breakfast game by visiting Bouchon Bakery at Rockefeller Center. The latte and vanilla scone were great! If you can snag a bar stool, you will have great views of the TODAY show right across the plaza. From there, we headed to our main stop for the day, the Museum of Modern Art (MoMA). The museum holds a special place in my heart since the first time I visited several years ago to see Van Gogh’s Starry Night, which is my absolute favorite painting. We could never miss a chance to see it again. We focused our time on the Impressionist wing, including Van Gogh’s Starry Night and others, Monet’s Water Lilies, and a few good Picassos. There is nothing better than a Sunday afternoon and art! Sunday evening, we had 4:30PM reservations for Toloache given our 6:30 showtime. They open early for guests with reservations, and we were one of the first few groups to arrive. Within 20 minutes the restaurant was FULL! Mexican food was a good shakeup for us; the margaritas were strong, the guacamole was fresh, and the food was full of flavor! Pretty much perfection in the Mexican food game! We headed out around 5:45PM to walk to Schubert Theater for the main event. To Kill a Mockingbird is a book I barely remember reading in grade school. I did not have a chance to re-read the book prior to our trip, but I knew seeing the play first would inspire me. The theater itself is quite small and vintage, but super cozy and fun. The show tells the story from a different perspective than the book, but follows the story line pretty much spot-on. I was blown away by the acting of Jeff Daniels and the whole cast. Multiple times throughout the show I was laughing, crying, and/or getting chills. If that’s not a sign of a great entertainment experience, I do not know what is! Getting tickets to this show is not easy or cheap - but it is TOTALLY worth it! A lifelong memory, for sure! Monday was Martin Luther King Day, so we were able to extend our weekend and travel home that day. We slept-in, packed up, grabbed a quick bite at Starbucks, and headed back to EWR. We had a relatively pain-free flight back to Chicago, and just happened to dodge all the snow and rain that happened that weekend! New York City is a perfect long-weekend getaway. Having the shows each night gave us just the right amount of structure, while still allowing exploration and experiencing new things during the day. The hotel, meals, and shopping were excellent - not surprising for the Big Apple! New York will always be a place to return, so I’ll be keeping my eyes and ears open for future inspiration! Check out my full list of locations on my shared NYC Google Map below!